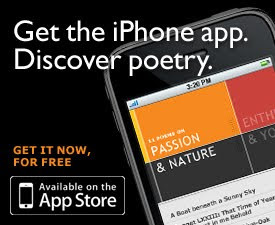 The P&PC Office has just downloaded the Poetry Foundation's cool iPhone app, and we love it. 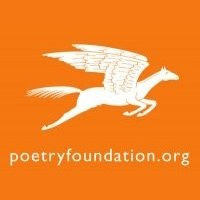 In the Foundation's words, the new app means "you can now take hundreds of poems by classic and contemporary poets with you wherever you go," but we're less interested in this portability—which simply extends a long tradition of pocket editions and pocket anthologies into the digital age—than we are in how the application itself is structured around traditionally popular ways of poem reading instead of the Modernist ones that first gave Poetry its street cred. If you are into the individual talent or the individual masterpiece, this app does give you—via a little window at the top of the screen—the ability to search for specific "poems and poets," but that method of poetry finding takes a distinctly secondary back seat to others: you can more easily browse poems by "mood" or "subject" or, if you press a "spin" button or simply shake your phone, the app randomly cross-indexes moods and subjects to produce a catalog of poems along thematic lines (as in the first image above). We just shook the tax-deductible office iPhone, for example, and came up with a list of poems themed around the intersection of "Optimism" and "Work and Play." A second shake gave us "Passion" and "Nature." A third gave us "Worry" and "Youth." Surprisingly, for a little magazine that has come to be associated with individual talents and poetic personalities, the new app is pretty author-free: as the "spin" results in the image pictured above indicate, moods, subjects and titles are far more crucial to the app's operation and use than the author names that dominate the organization of classroom anthologies like the Norton or even the table of contents for Poetry magazine itself (see Vol. 1 No. 1 pictured below). The Poetry Foundation apparently knows, however, that author names and specific poem titles often pale in importance to subject matter, theme, or mood among a popular readership and so, in reaching out to that readership via the iPhone app, the Foundation has put on a distinctly popular face—a face that probably has Ezra Pound rolling (if not spinning) in his grave. (Try to imagine, for example, an anthology of Modernist poetry being structured around sections titled "Joy" and "Commitment"!) 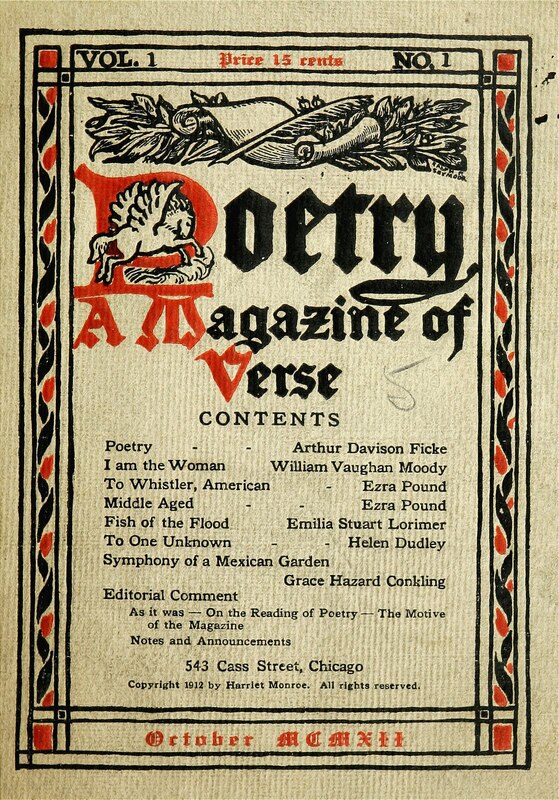 That is, after nearly a century of standing for modernist quality, taste and discrimination, Poetry has gone thoroughly middlebrow if not downright popular in its ambitions, and it's not the world of the little magazine but digital communication technologies—such as the Poetry Tool on the Foundation's web site and the iPhone app discussed here—that have taken it there. So, what are the implications of this finding system? 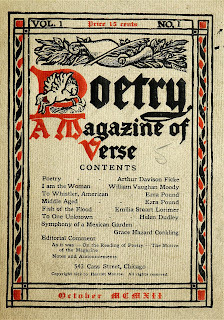 For one, the iPhone app appears to completely disregard the importance of style, poetic voice, or school of poetic thought when it comes to poetry reading; the modernist call to originality (Pound's battle cry to "make it new") takes a back seat to an index that trucks in the vague categories that Pound cautioned against in the March 1913 issue of Poetry magazine when he wrote "Go in fear of abstractions." As its transhistorical themes suggest—Shakespeare, Christina Rossetti and Ella Wheeler Wilcox (pictured here) turn up together when our spin results in "Passion" and "Nature," for example—the app also foregoes categorization along the lines of literary periodization, disrupting the oftentimes Hegelian narratives of literary history that Poetry and Modernism depended on for literary cachet; thanks to Apple, AT&T, and the Poetry Foundation, all poetry—to misquote T.S. Eliot—is eternally present. The depreciation of style, the subordination of the individual talent, and the loss of a linear literary narrative results in a general homogenization of poetic history that might leave Harold Bloom, the avant-garde, the English major, and the M.F.A. student at a loss for what books and dissertations to write next. 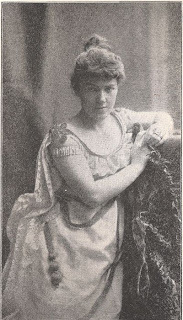 But with the removal of brow lines, the disappearance of an aesthetic priesthood, and the waning aura of authorship and history alike comes a possible restoration or reconfiguration of the early 20th-century reader whom Joan Shelley Rubin has examined in Songs of Ourselves: The Uses of Poetry in America. 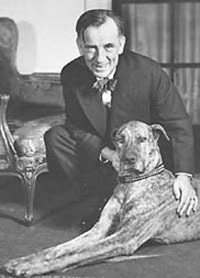 In the day before scholars took it upon themselves to separate highbrow poetry from lowbrow poetry and genteel poetry from modern poetry, Rubin argues, Americans read eclectically, finding and using poems from various literary traditions and time periods for many different purposes, in the process becoming "repositories of both the high and the popular—aware of, but not constrained by, a shifting boundary between them." If the Poetry Foundation is reaching out to touch someone, this is the reader it's likely got in mind. Make no mistake, P&PC is not claiming that the Poetry Foundation iPhone app is the new beacon of popular poetry reading, although it does improbably contain eight poems by one Edgar Guest, the "people's poet" of the Detroit Free Press (pictured to the left) who would have never fit with Poetry during his lifetime, although he was awarded an honorary degree by the University of Michigan—a school that had bestowed the same honor on Robert Frost. 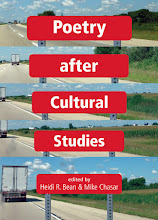 However, we are enthused by the new sets of categories which encourage readers to apply poems to their lives and not just to their term papers and GRE tests, and we like the restoration of affect to poetry reading that this suggests. (We're also very curious, btw, about the process of designing the app.) 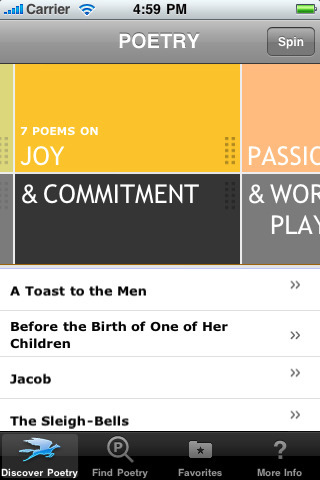 Combined with the "spin" feature—which makes us think of a disc jockey playing records on a turntable—these aspects of the poetry app make us feel like we're holding and carrying around a sort of portable, poetry mix-tape generator. Maybe that means an audio version will be available soon?